The URAC could not agree on a recommendation to the Davis City Council on a preferred rate option. We probably had too many options with too many proposals for most members to sort through. In retrospect, we probably should have used pairwise comparisons to narrow down the choices for a final vote. URAC members now have the option to submit a statement in support of a rate proposal. Frank Loge and I previously composed a statement on why summer water costs are higher, a portion of which I posted here. We will submit another statement in support of seasonal rates. Fellow URAC Member Frank Loge and I wrote about why Davis water supplies cost more in the summer and why simple economic principles lead to those costs being allocated to the highest period of use—the summer in this case. We want to expand on that statement of economic principles to suggest that the Council adopt seasonal rates with a summer premium. Davis has extolled itself as being environmentally progressive. We have adopted an aggressive plan to reduce our greenhouse gas emissions and we have required proposed housing developments to adopt stringent standards that minimize environmental impacts. We should extend that commitment to how we use our water. Moving to a surface water supply is an environmentally responsible way to reduce the impact of our wastewater discharges and the GHG emissions created by pumping water with electricity. However, we don’t get a free pass on using this new water source. The greatest environmental stress on the Sacramento-San Joaquin Rivers Delta occurs in the summer months when river flows ebb. The SWRCB already has ordered curtailments for junior water rights holders (which includes Conaway Ranch) and may order further summer cutbacks. We need to set water rates that reflect our commitment to reducing our footprint on the environment. That means charging a premium on summer water use when environmental costs are higher. These higher environmental costs are consistent with other system costs including infrastructure and water rights, so the Council can rely on the draft rates constructed with to reflect those underlying seasonal cost patterns. According to analysis prepared by Bartle Wells and presented to the URAC, 55% of total system costs are higher during the summer than the winter period. In addition, current water pumping costs also are higher during the summer as that PG&E commercial time-of-use rates go up during the summer. Under the draft seasonal rates, summer volumetric charges would be 46% higher than winter. These rates should not be tiered for two reasons. First, examining single family residential (SFR) use by decile shows that all but the lowest rank uses about twice as much water in the summer as in the winter. That means all customers are creating higher summer costs, both financial and environmental, and all should be signaled to conserve. Second, recent studies have shown that tiered rates have not delivered on promised conservation. While the highest users who see a high price may conserve, the lowest users see a below-average price that causes them to overuse water. The two effects offset each other. Using tiers to address concerns about low-income and senior customers causes such benefits to leak to wealthier customers who don’t need the assistance—this issue is best addressed through other rate assistance programs outside of setting the standard rate. Finally, the Council should look closely at the amount of fixed charges included in the rates. While a large portion of the costs may appear fixed in the short run from an accounting standpoint, from an economic standpoint (which the appropriate stance for setting rates) the City has invested in much of the infrastructure and water rights to meet long-term variations in demand. This means that the water supply and even some of the local distribution system costs are actually variable costs. The Water Advisory Committee (WAC) found that 87% of system costs fall into this variable category and we haven’t seen information to cause us to revise this estimate. Of concern though is that the City can’t ignore the financial accounting of costs, most importantly debt service. Debt rating agencies that drive bond interest rates want a higher fixed revenue component. For investor-owned water utilities in California, particularly smaller ones, which rely on higher variable revenues than most municipal utilities, the swings in revenues have caused financial distress of late. The City must balance the desire to match rates to costs with the need to meet financial commitments. This can be done in one of two ways. The first is to establish a hydrologic conditions or “drought” balancing account that accrues revenues in low-cost “wet” years and is drawn down in high-cost “dry” years. Establishing such an account, however, means that rates are likely to be higher in most years than if the rates had a higher fixed cost component due to higher financing costs. The City essentially has to carry two components of debt, the first to pay for the new water supply system and the second to fund the balancing account. The second method is to increase the amount collected in fixed charges each year so that the variation in revenues doesn’t cut into debt service. Bartle Wells has recommended a minimum of 40% in fixed charges that is consistent with practices with other municipalities. We don’t have a strong preference for either approach, but the Council should be aware of its choices. Below are two charts I prepared during the URAC meeting (and shared) that compare bill shares across usage deciles for SFR customers. 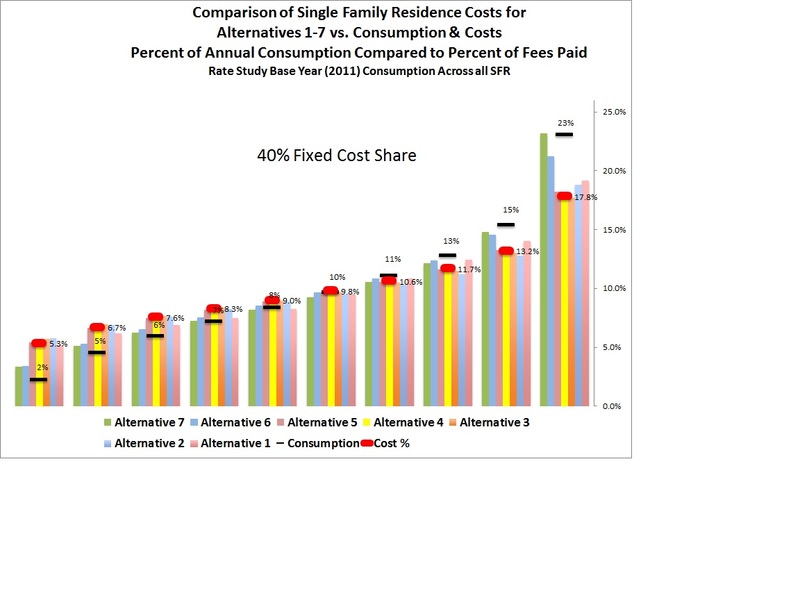 The first chart shows allocations with 40% fixed costs, the second with 13% fixed costs. Note that the consumption shares are steeper than the cost shares due to the fixed costs. 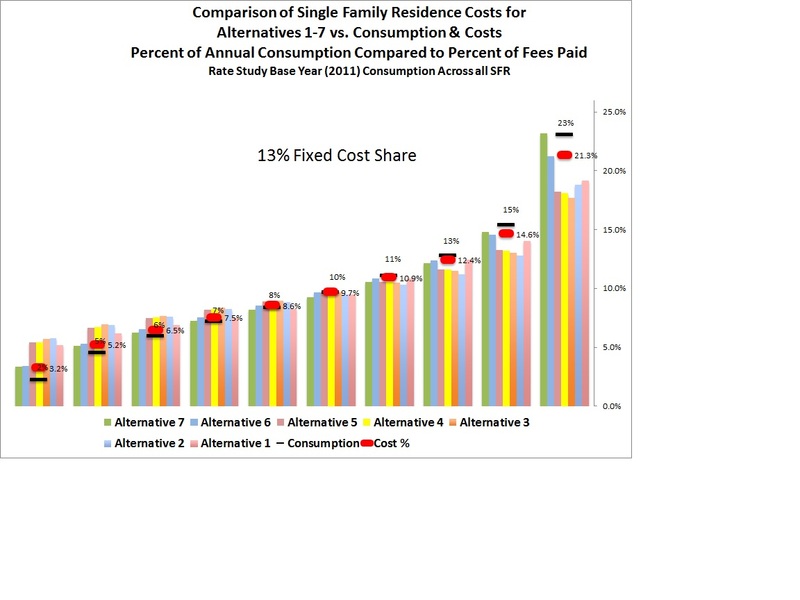 At 0% fixed costs, cost and consumption allocations would be identical. It’s important to note that consideration of fairness must not be a simplistic analysis of average water consumption, but also must consider the other investments and costs incurred to deliver that water. BTW, here’s an interesting mathematical treatise on how to set seasonal water rates.